Welcome to Berkey Supply. 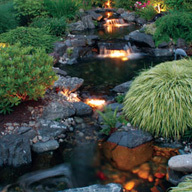 We are located in Bellevue, WA and are a nationwide supplier of equipment for ponds and water features, (for commercial, garden water features and backyard waterfall systems) rainwater harvesting, greywater irrigation systems and outdoor lighting (including 12 volt landscape lighting). We believe that a water feature is a landscape-complementing piece of art that is intended to entice the senses and provide both relaxation and a sense of calmness. Over the years we have helped design thousands of water features of all sizes and shapes, from commercial water features to residential, and from small to large water features. Aside from designing water features we have also sold hundreds of features to do-it-yourself homeowners who wanted to create a water feature of their own. From our extensive experience we have created our water feature kits to help the homeowner or contractor build the feature of his or her dreams with minimal complication. To learn more about the different types of water features that we offer, view the garden water feature section below. You should enjoy your landscape even after the sun goes down. 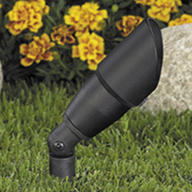 Landscape lighting helps to provide beauty to your landscape after dark and can also assist in illuminating pathways and driveways for safety. We offer a wide selection of outdoor lighting fixtures by the most well respected professional lighting brands on the market. Our selection of fixtures are avaiable in a wide variety of differnet colors and finishes. Are tree roots threatening your landscape? One of the most effective ways of protecting planting areas, driveways, walkways and water features from the damages of tree roots is to install a root barrier. These root barrier panels effectively stop the tree roots from passing the barrier and encourage downward growth which helps to anchor the tree and provide stability. If you are looking to contain bamboo roots, our selection of HDPE bamboo barrier provides dependable containment for all types of bamboo species. Visit Rhizome Barrier Supply for an extensive selection of HDPE rhizome barrier in a wide variety of different sizes and thicknesses. Looking to protect your home's foundation from water intrusion? HDPE sheets can also be used as a very effective water barrier. Grass pavers allow for grass areas to be reinforced for vehicular and pedestrian traffic. 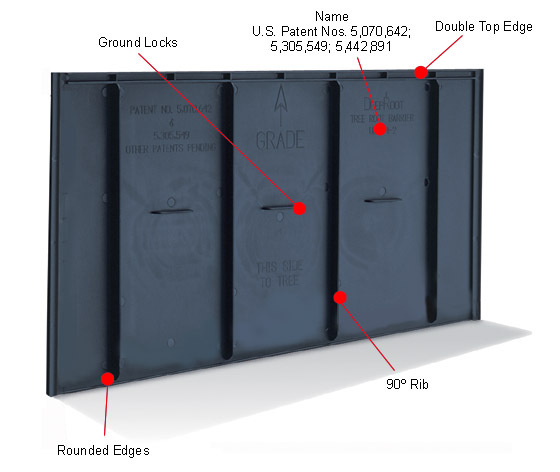 The ultra-strong grid structure provides reinforcement for vehicle weights ranging from single passanger carts to fire engines and semi trucks. The pavers are often used for fire access roads, parking lots, and driveways in both residential and commercial settings. 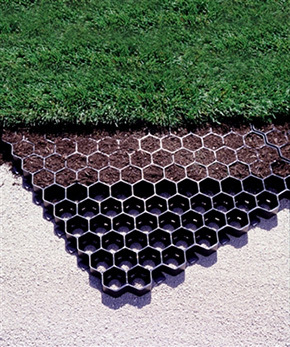 Grass pavers are available in both panel and roll form and can be cut to meet site obsticles such as curbs, sprinkler heads, benches and light posts. 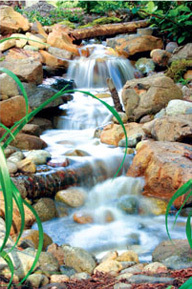 We offer numerous waterfall kits in multiple configurations for the many different backyard waterfall possibilities. From large impressive backyard waterfalls with an included stream and vanishing pool to simple streams or simply a small waterfall to the side of your patio or deck. Which ever configuration you choose we have a outdoor waterfall system to make it happen. Aside from allowing you to be completely creative in the look and design of your system or kits are built upon rock-solid Filtrific technology. This technology incorporates an advanced waterfall filter with a durable pump chamber which protects the waterfall pump from any damage. This along with many other advantages included with our Filtrific based systems give the homeowner assurance that they are buying the highest quality professional grade water feature equipment on the market so that their backyard waterfall can be enjoyed for years to come! Considering building a pondless waterfall? Learn about how our kits give you a far more natural looking water feature than the conventional pondless waterfall kit. 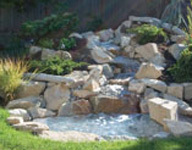 View our landscape waterfall photo gallery for examples of waterfalls built using our kits. A garden water feature is a term that incorporates a variety of landscape water features that compliment the garden. One type of garden water feature is a disappearing waterfall. This type of water feature functions as a waterfall and/or stream when turned on and disappears underground when turned off. 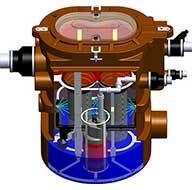 This allows for reduced electricity usage and the elimination of string algae. Learn How to Build a Pondless Waterfall in our step-by-step guide. Another type of garden water feature is one that resembles a bubbling rock. This type of feature is easy to install and allows you to add a water accent where there is not enough room for a full garden waterfall or pond. Our kits include all of the hardware required for a successful installation. 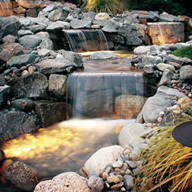 Unique to our bubbling rock water feature kits is the ability to add a vanishing pool to the base of the rock. This pool will be present when the water is running and will disappear when the water is turned off. If you enjoy water gardening, perhaps a pond with a waterfall should be considered. This style of water feature can support all aspects of water gardening including floating water-plants and fish since the pond is always full never vanishes even when the system is turned off. An advanced pond filter is included and as with all Filtrific based systems you have the freedom to place the Filter Tank away from the water feature as best suits the landscape due to our remote pond skimmer technology. With only the access cap showing, its small footprint is easily disguised and allows for a more visually appealing waterscape. 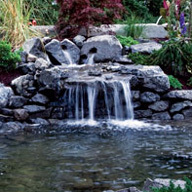 We offer multiple pond kit sizes for building beautiful ponds with stunning waterfalls. For help with building your pond view our how to build a pond guide. If you want a little bit of pond and a lot of stream then the Filtrific Hybri-Pond type of installation is the pond design of choice. With this system the stream appears when the stream pump is turned on and disappears underground when the pump is turned off. All stream water is captured underground so the pond does not overflow. This allows a smaller and more easily maintainable landscape pond installation as well as a more energy efficient installation. Enjoy significant electrical savings by turning the larger waterfall pump off when you are not there while keeping the much smaller circulation pump running to maintain water quality in the remaining pond. If you desire a formal landscape design, consider an elevated or ground level concrete water feature using a concrete fountain kit. This can add the perfect accent to a courtyard, entryway or add a classic focal point to the open landscape. 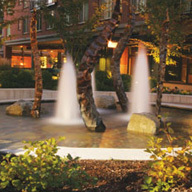 Many creative aspects can be incorporated including a landscape fountain, water sculptures, or reflecting pools. The Filtrific System simplifies the installation by combining pump, auto-fill, overflow and low water controls all in one convenient location, next to or away from the water feature. We have always believed in being good stewards of our environment and to us, responsible use of our natural resources is paramount. Because of this we now provide our customers with access to the Flotender line of Greywater Systems. These products allow the homeowner to reuse the water from their shower, washing machine and bathroom sink for use in landscape irrigation. Not sure what you need? Give us a call 1-800-959-8353 or email us at support@berkeysupply.com and our friendly, knowledgeable sales staff will gladly walk you through your order.